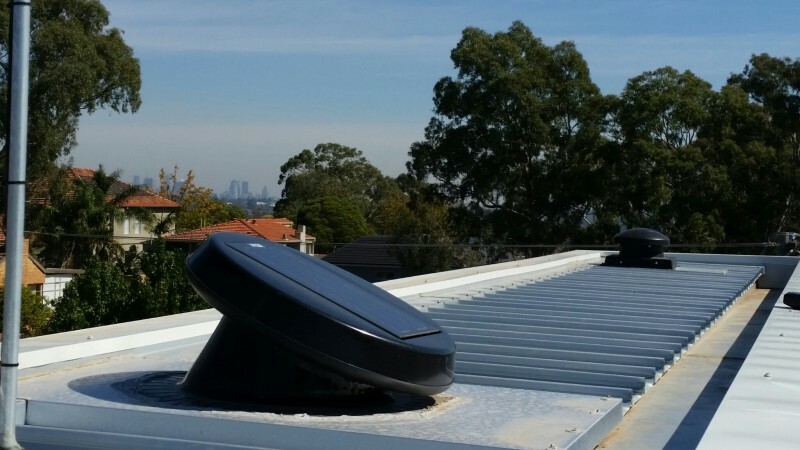 The Owner of this contemporary town house in North Balwyn, Melbourne was concerned that the upper level Kliplok roof would trap stale air, he came to us find out on what the implications might be and also for advice on which products were available to improve air flow. We could see that without air flow in the roof cavity two serious problems would occur. Firstly during the cold winter months condensation would build up inside the roof. This trapped moisture could cause long term damage to the roof structure and also make the living space cold and damp and uncomfortable. The second problem would be over the summer as the trapped heat would radiate into the upstairs bedrooms in the summer months. A problem probably made worse by winter dampness causing the installed insulation to collapse, dramatically reducing its performance and effectiveness. We offered the Solastar on a pitched flashing as the ideal solution, this unit can be elevated on a pitch towards the winter sun, and still be well sealed to the deck roof with the metal base and custom flashing to match roof profile. We also fitted a smaller vent at each end of the roof to improve return air flow from the outside into the roof space.